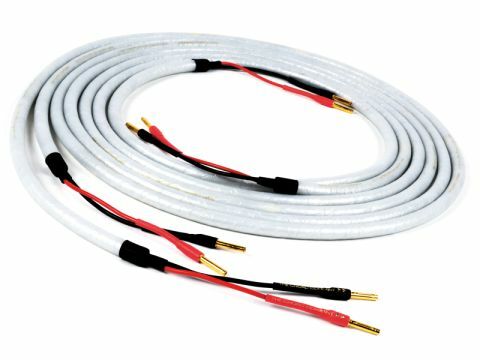 Screened loudspeaker cables are not all that common. Interconnects tend to be screened because the signals they carry are much lower in power. They're more easily interfered with by stray electrical fields and a screen largely blocks those. It is indeed pretty much unknown for speaker cables to pick up interference in an obvious way and yet there may still be a good argument to screening them and hence reducing the amount of RF pick-up fed back into the amplifier, where its effects may be subtle but insidious. Interestingly, the Carnival doesn't actually connect the screen electrically to the conductors, but it will still have an effect. The conductors themselves are medium-thickness, PVC-insulated copper, twisted together for best rejection of magnetic interference (which is not blocked by a screen). Screened cables can, in some cases, have high capacitance, which doesn't always agree with amplifiers, but that's not so in this case. Considering that this is, by most standards, a budget cable, performance is creditable. The bass may lack a little in raw punch and drive, but midrange is neutral and the treble admirably clear and extended, with plenty of insight and a real sense of air and space around notes. Imaging is also good, with some of the best depth we've heard from a cable at or near this price, while in terms of detail there's just the slightest trace of constriction in complex musical climaxes. Unless you absolutely demand the ultimate in bass, this cable is a strong recommendation for budget and even moderately upmarket systems.